a quiet zone. Placing all the tools and supplies they will need in this area will prevent distractions and keep them organized. This will also allow you to monitor when supplies are running low so you can replenish them as needed. house book bags, umbrellas, notebooks with plenty of bins or hooks that keep everything in one place will keep everyone organized. In the morning, this is a good place to put lunch boxes and other items so that when it’s time to leave, everyone can grab and go. PRO TIP: An often forgotten, but perfect place for a check-in station can even be under the nook of the stairs. It’s out of the way but can be customized for maximum organization and space-saving. Another great solution in organization ideas is to place bins near the door. 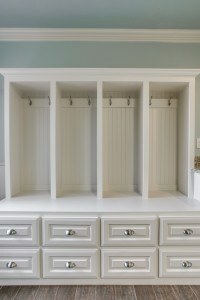 This will allow everyone to quickly place and find their jackets, hats, shoes and other items that are worn every day. Giving each person a designated bin by color alleviates confusion and will not only provide organization but will keep each person responsible for their own items. Using a small bookshelf to keep each bin will provide a nice, organized area that won’t destroy your décor. Having a family calendar for everyone to see at-a-glance is high on the list of organization ideas. Using creative tactics like a different marker color for each person will help them keep track of what they are supposed to do or any important dates that are near. This calendar can be used for chores, activities and more. There are a variety of calendars available that will keep the family organized, and work wonders in tips great organization ideas. You can use a number of calendars together in a wall collage that will highlight each activity or chore, or have one calendar for each person. Among current organization ideas, chalk is in! Many families are utilizing chalkboard paint in the kitchen, bathroom, and bedrooms for reminders and notes. This can be very useful in keeping important dates front and center, or for quick little reminders that may easily slip the mind. Children love chalkboard walls and it provides a way for them to contribute to keeping the family organized. These are just a few organization ideas that may come in handy when getting back into school mode. Depending on your needs, each one can work well in helping to provide a central location for your kids and the entire family. These organization ideas are quick and easy to create and will blend right into your design scheme. DFW Improved is a full service licensed general contractor that handles a wide variety of construction projects, whether you need a home addition or a kitchen remodel. When tops results are the goal, DIY isn’t always the answer. Let us put our design-build team to work for you! For more information, click here to send us a message or simply give us a call at 972-377-7600.